Phew, what a week! An adventurous trip to Mustang – what a great way to welcome the winter, right? 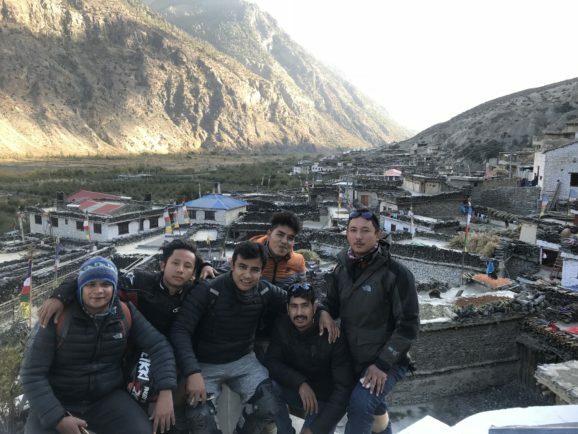 Last week, I went on a 5-day trip to Mustang with Theme Palace team. A place where I think everyone must visit at least once in their lifetime. Actually, it was a ride to Mustang; we all rode to Mustang from Kathmandu (771 km) on our motorbikes. So, guys brace yourself, ’cause I’m about to tell you how exciting and venturous journey it was. Let me start my trip-story from the very beginning. So, as you all know, I’ve been a part of the Bfit Exclusive family for quite some time now, which is run by my friend and brother-in-law Sunil Karmacharya. And Bfit is also the place where we all (me and the Theme Palace team) do our little chit-chat sometimes. We decided it was time to organize an Annual Retreat. Everyone from Theme Palace were also willing to do something audacious and lively for the annual retreat. 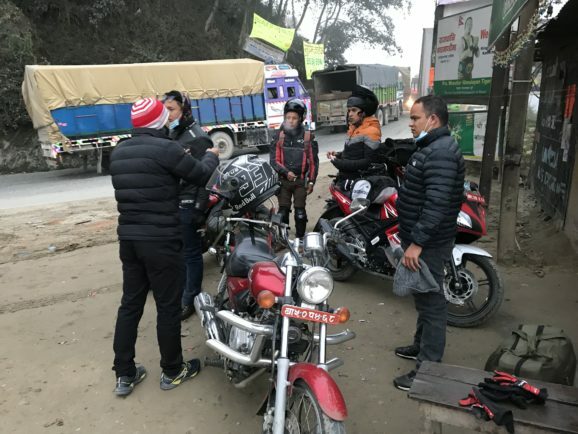 The plan about Mustang first began as a joke; then, we started talking about it more often and that is how, the ride to Mustang officially was marked on the calendar. But, just a day before our trip, there were news (probably a hoax) that there had been snowfall and rain in Mustang. I think the weather update was quite beneficial for me, because it made me aware of the necessary things I should carry along with me. Keeping that in mind, I went shopping and bought myself a pair of trousers, waterproof boots, knee and hand guards, and of course, jackets. So, you can say I was all prepared for whatever the weather had in store for us. November 1st, 2017 – the day was set to start our trip. On November 1st, Wednesday, we all met at Acclaim Technology building and were pumped up with excitement to start our trip. 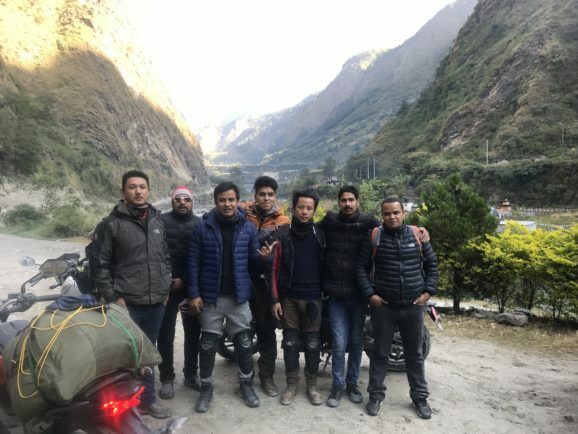 We were a total of seven riders – Sunil Karmacharya, Yam Chettri, Raj Kumar Tamang, Sachet Gurung, Sudamma Thapa, Amit Subba and me of course. 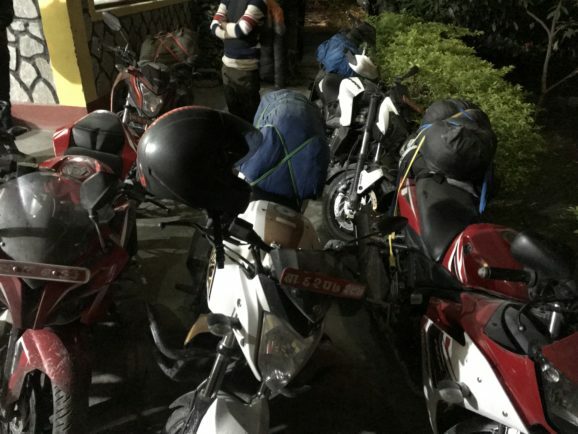 With the plan to reach Tatopani that day, we left the building at sharp 5:30 A.M. However, Rajkumar made a small slip while travelling. He carried a duffel bag with no hooks tied to it. The bag had to be tied to the bike, otherwise, it would fall off. We had no idea what to do. So, we went to every shop possible in Kalanki in search for a rope or some wire to tie his bag. We were lucky enough to find a wire and we all re-tied our bags near Nagdhunga. It kind of made the initial start of our journey a bit delayed. But apart from that, we didn’t face any other obstacle while starting off our journey. We stopped at Hamlet Restaurant in Dhading for breakfast around 7 in the morning. It was really fun. Actually we had a lot of tea-breaks during our ride. And trust me when I say this, we were really carefree and having fun during each tea break. We were having so much fun that no one really cared about the timing. 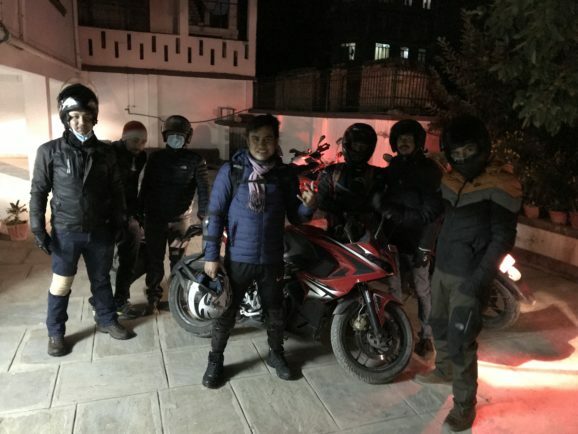 And also, since no one in our group had ever visited Mustang in motorbikes before, nobody really knew how much time it would take to reach there. We reached Pokhara around 11 A.M. and had our lunch in Janapriya Thakali Restaurant. The lunch was very delicious and off we went to Tatopani. The fun and short breaks continued. But, the dark side about this fun we were having was cut short because we completely forgot about the off-road travelling. We reached Beni at around 6 in the evening. It took us around 6 hours to reach Beni from Pokhara, which was really longer than it normally takes. It was getting dark and there were no street lights as well. The only light we had were the headlights from the motorcycles. We could barely see the whole road. This was the time when we all started to realize the consequence of that “fun” we had earlier. But, I don’t regret it though. The roads were all off-roads, the visibility was extremely low, and the worst thing, we came across so many streams that we had no clue about. After all the struggles, we were still able to make it to Tatopani without a single injury. We reached Tatopani at around 8 or 9 P.M. We were all very tired and stressed out, so, keeping the thing in mind that we had to travel off-road again tomorrow, we all had our dinner and went to sleep as soon as possible. We stayed at Tatopani that night in Mount Annapurna Resort. The next morning, the second day of our journey began. We had to travel from Tatopani to Jomsom that day. We all had our breakfast and left for Jomsom at around 9 A.M. Yet again, the off-roads and streams continued. However, the good thing about this journey was that we could observe the beautiful scenery everywhere. Mountains, Waterfalls, the surrounding, everything was just so great and beautiful, except for the roads, obviously. But we all had extreme fun on our way to Jomsom. We stopped at every place possible, including Marpha, and Tukuche. Marpha is quite famous for apple; we stopped at Marpha and roamed around a little, had syau sukuti made from apple, which was very delicious. There were many narrow streets, many monasteries, and surprisingly all the houses in Marpha were painted in white. So, I would say Marpha village was beautiful with unique architectures, serenity and mostly white :). Observing the view, waterfalls, and suspension bridges, we all got to Jomsom in the evening. We stayed at Hotel Mountain Breeze in Jomsom. Since we reached there a little earlier, the fun began early too. We played guitar, danced and had our dinner. (I want to suggest everyone travelling to Mustang or just traveling in general, to check the menu and prices before ordering your food. Because, staying in Jomsom, I realized that the food pricing in Mustang was far more expensive than here in Kathmandu.) 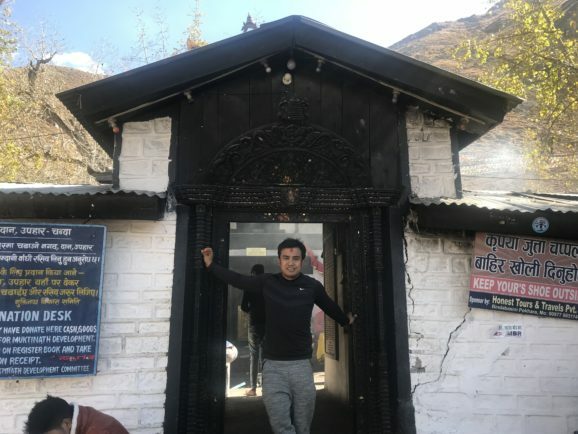 So, that’s how that day passed and the next station for us was the sacred place of Mustang – the Muktinath Temple, which was around 25 km from Jomsom. So, we all ate our dinner and headed off to sleep. 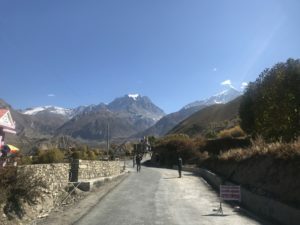 The third day – with our mind set to reach the Muktinath temple, we left the hotel at around 7 A.M. Playing along with the nature and its beauty, still going off-roads but with intense view of mountains, we were on the road of Kagbeni. We reached Kagbeni and shocking, yet surprisingly, the roads from Kagbeni to Muktinath was all fresh-tracks. After all those ups and downs, through streams and rivers, across the suspension bridges, it was really unexpected to see the black-topped road there. Time for fun, time to hit the real road! I was so excited and happy to ride on a normal road again. So, you can say the ride to Muktinath was the best ride of the entire journey. We reached there and visited the holy temple. It was a very nice and interesting place. There were many small temples, statues of Lord Buddha, sacred ponds and also a helipad; in case you want to directly land in Muktinath temple. 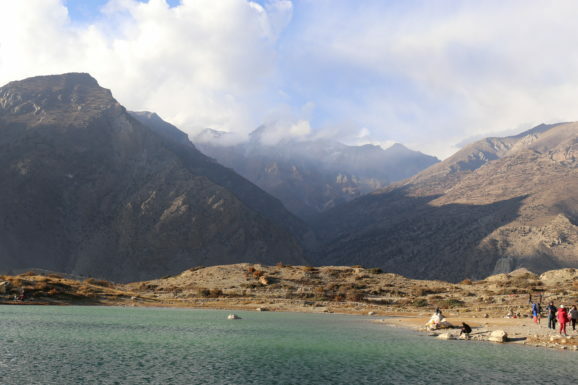 We also visited the Dhumba Lake, one of the most famous tourist attraction in Jomsom. It was a beautiful lake and the water of this lake was Emerald Green. The fun continued, followed by a plethora of photo sessions. One of the most exciting part in Mustang was the wind. The wind was so strong that one could barely walk. But, it was so much fun that you just have to see the video below to know how windy it was. So, that was it, time to go back home. Honestly, leaving Mustang in such a short period of time was a little desolated for me. I wish I had more time to visit there. But still, I had a very great time and I was leaving with so many beautiful memories of Mustang. We left the hotel in the morning right after having a cup of black tea. Returning back from Mustang, I recaptured the surroundings, beauty of nature and possibly everything I could fit in my mind. We travelled directly from Jomsom to Pokhara without stopping for anything other than lunch and few tea-breaks. The fun never left, it was always there. While coming back home, we went to Busy Bee in Pokhara and had a very refreshing time there too. After going back to our hotel, we had a small team meeting, one of the most important part of the annual retreat. During the team meeting, we discussed about our business, how it’s going, the future goals and further planning to grow our business. The meeting lasted for around an hour or two. After that, we left for Kathmandu the next morning and we were back in Kathmandu on November 5. It was one hell of a hair-raising experience I had while riding to Mustang. The 5-day holiday trip was full of excitement, adventures and just FUN (although if we could’ve spend a little longer there, it would have been awesome-er.) I strongly recommend all of you to visit Mustang at least once, or those who love biking, this is one of the best route for biking; it’s really worth it. Adventure, excitement, beautiful scenery, sacred places, delicious foods, a lot of fun, you name it, Mustang has it all. So, if you guys are also thinking about going on a long journey on your motorbike, clothing preparation should be the first thing to prioritize. It’s because biking is all about the wind and dust. So, one should be well prepared. Don’t worry, I’ve got a short list including some tips on what to fill in your backpack before leaving for a long tour on your motorbike. 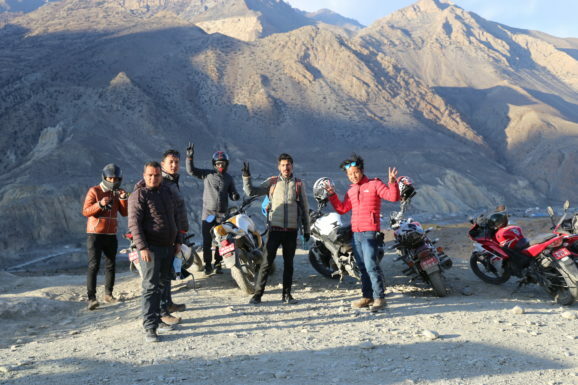 Here are some of the snaps and videos from my adventurous ride to Mustang with Theme Palace team. This entry was posted in Events, Life, Travel, Travel to Nepal and tagged Bike Tour, Jomsom, Marpha, Muktinath, Mustang, ThemePalace, Tukuche by sakinshrestha. Bookmark the permalink. Sir!!! Sounds quite amazing!!! Congratulation to the whole team!! !